To celebrate ‘Apple Day’ on 21st October, we’ve compiled a list of the top five health benefits of eating apples. It turns out that eating an apple a day may actually keep the doctor away. According to a number of studies, apples are particularly good at keeping us healthy. Here are our top 5 health benefits of eating apples. Scientists from the American Association for Cancer Research agree that consuming flavonol-rich apples could help reduce your risk of developing pancreatic cancer. Studies have also identified compounds in apple peel that show potent anti-growth activities against cancer cells in the liver, colon and breast. Eating at least one apple a day may make you less likely to develop type 2 diabetes. This is because they are loaded with soluble fibre, the key to blunting blood sugar swings. A compound found in apple skins prevents the cholesterol that gets into your system from solidifying in your artery wall and causing coronary artery diseases. 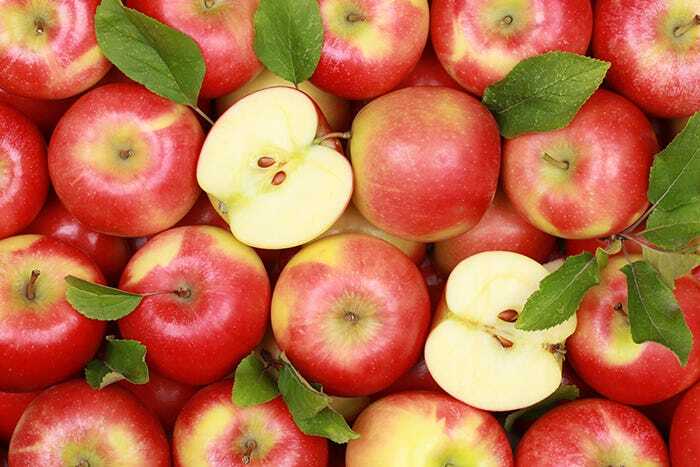 Red apples contain an antioxidant called quercetin which can help boost and fortify your immune system. Gallstones form when there’s too much cholesterol in your bile for it to stay as a liquid so it solidifies. To prevent gallstones, doctors recommend a diet that contains food that is high in fibre which includes apples.